Enhance your home’s curb appeal this year through your landscaping efforts! Spring is a beautiful time of the year in the Mid-Atlantic region. 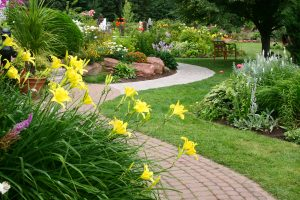 Since warmer weather is finally upon us, homeowners can start turning their attention to their landscaping efforts. If you are looking to enhance the curb appeal of your property this year, you have come to the right place! Here are a few ways you can improve your landscape this spring season! Timing is so crucial when it comes to planting. Many homeowners make the mistake of planting flowers, trees, plants, and other forms of vegetation at the wrong times. Be sure to do your research and plan accordingly. You also want to be cognizant of the climate of your property. For example, since some species of plants need more sun than others, you want to know which spots of your yard are especially sunny. When it comes to landscaping, planning is everything. To create a cohesive landscape, you must plan it out. You need to determine which plants you are going to incorporate into your yard, the layout of your landscape, and also the tools/equipment that you are going to need for every task. Sometimes, it can be challenging to find the right direction to take with your landscaping efforts. With that said, sometimes you just need to seek out some inspiration! Don’t be afraid to walk around your neighborhood and see what other people in your area did to their yards. You may find a few things that appeal to you. Also, be sure to spend some time browsing through your local nursery for some ideas as well. It is important to realize that most plants and trees are going to grow over time. For this reason, it is critical to factor in growth when you are planning your landscape design. All too often, homeowners do not consider how big trees and shrubs can actually become over time. This entry was posted on Sunday, April 15th, 2018 at 3:24 pm. Both comments and pings are currently closed.